Born and raised in northern New Jersey, Dr. Joseph A. Racanelli has built an exemplary reputation as one of the top plastic surgeons Brooklyn & NJ have to offer. Dr. Racanelli attended high school at the prestigious Delbarton School, prior to receiving his undergraduate degree from Boston College. He earned his medical degree from the Lake Erie College of Osteopathic Medicine. Dr. Racanelli completed his general surgery residency at Wyckoff Heights Medical Center in Brooklyn, NY, which is an affiliate of the Weill Cornell Medical College. During his general surgery residency, he trained extensively at The Memorial Sloan Kettering Cancer Center, The New York Presbyterian Hospital-Weill Cornell Medical Center, and in The North Shore Long Island Jewish Health System. Dr. Racanelli completed his postgraduate fellowship in plastic and reconstructive surgery at the Philadelphia College of Osteopathic Medicine. This is one of only a few osteopathic plastic and reconstructive surgery fellowships in the world. Training alongside several internationally recognized plastic, reconstructive, and cosmetic surgeons, Dr. Racanelli received the most cutting-edge training in all aspects of plastic and reconstructive surgery. 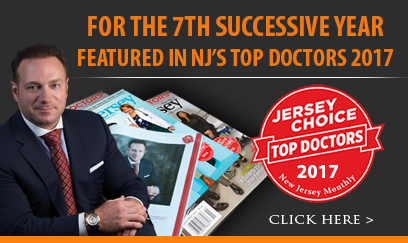 For multiple years in a row, Dr. Racanelli has been voted by New Jersey Monthly Magazine as one of New Jersey’s Top Doctors in plastic and reconstructive surgery. Dr. Racanelli offers his patients a wide variety of cosmetic and reconstructive procedures, from injectable fillers, abdominoplasty (also referred to as a tummy tuck), breast augmentation, and liposuction. Dr. Racanelli has gained recognition throughout the tri-state area for his outstanding surgical skill, excellent bedside manner and the overall attention and care he gives to each individual patient. To schedule a consultation with one of the best plastic surgeon Brooklyn and NJ can provide, Dr. Joseph Racanelli can be reached at any of his four offices located in Morristown, NJ, Newark, NJ, New York City, and Brooklyn. Please call (888) 982-3309.